During, and some years after the Belgian revolution (1830), the weapons in use by the Belgian forces were all from foreign origin. 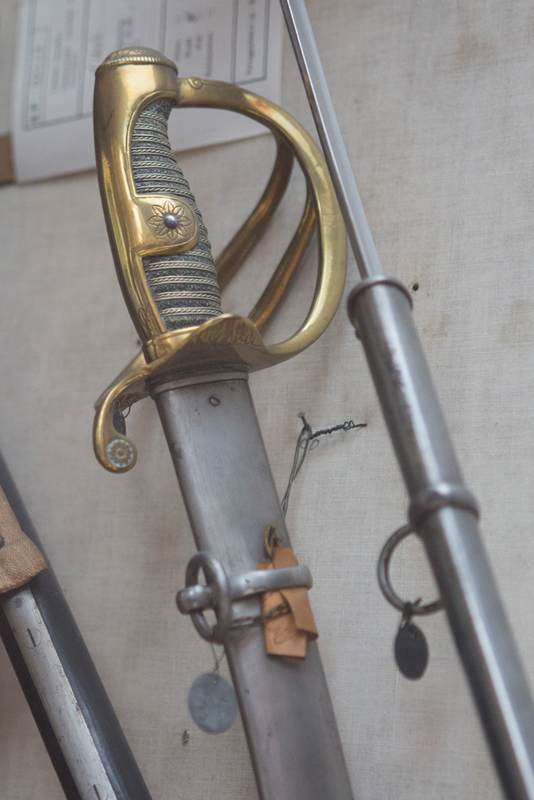 In fact, as far as sabers go, almost all saber types ever used by Belgian cavalry troopers were either foreign models or slight modifications of these models. An almost straight blade, without fullers. A median edge along the middle of the blade, up to the false edge. A steel hilt with three bars. 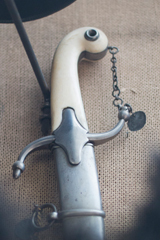 A pommel which extends along the back of the grip and sports two ears, which are connected, through the grip, by a rivet. 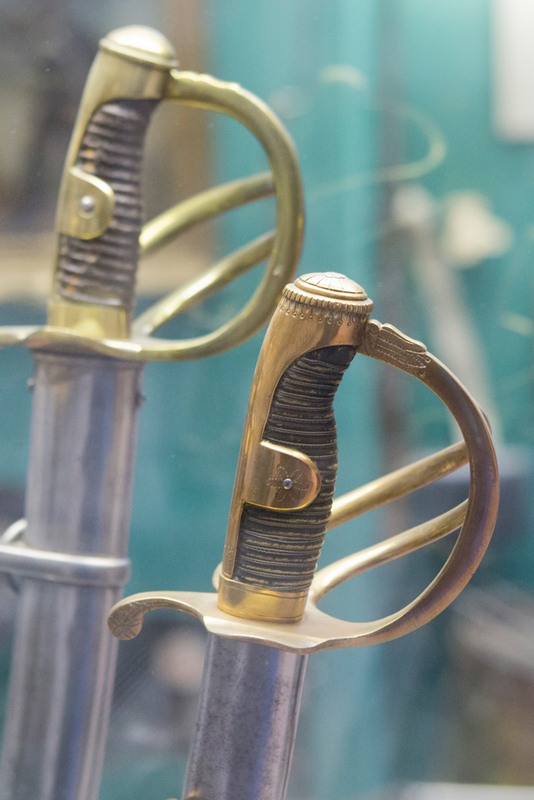 A hilt which looks a lot like that of the Montmorency model, which we describe further on. A wooden grip, with big spirals, covered in black leather. 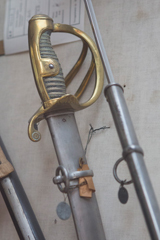 Based on this description, and the corresponding time period, this could be the English 1821 pattern Light Cavalry Saber, though Leconte mentions that the blade has no fullers. This is the Dutch model, without any modifications. 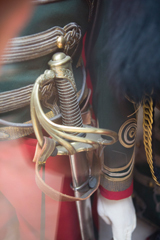 According to F. Pirron's article, it was in use by Cuirassiers before the advent of the Belgian model. However, the article calls this saber both nb 2 and nb 3, while the nb 2 and 3 sabers found in the Army Museum, do not correspond to the pictures in Pirron's article. This is the Dutch model, without any modifications. It was in use by the train squadron 'for a long time'. The blade is larger, shorter (86 cm) and shows more curvature (5.5 cm) than that of the Montmorency saber. The grip is very similar to that of the Montmorency saber, with 17 grooves. Total length of 99 cm. 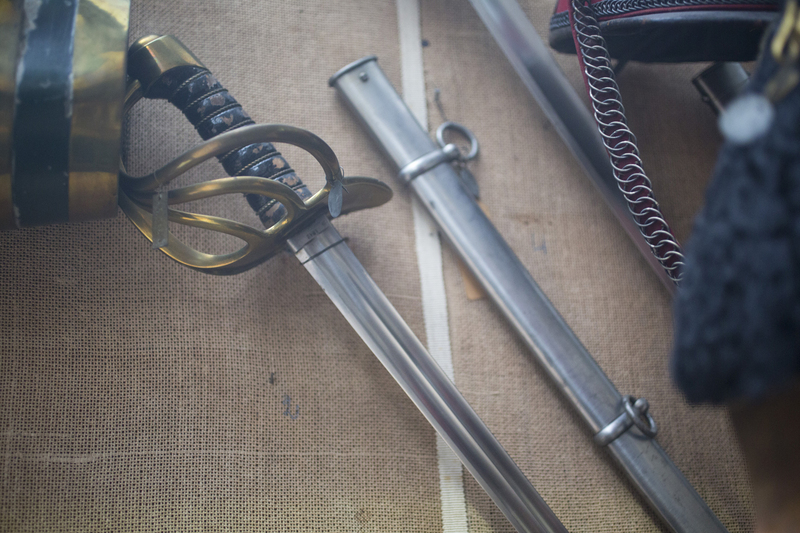 Steel scabbard with wooden inserts. 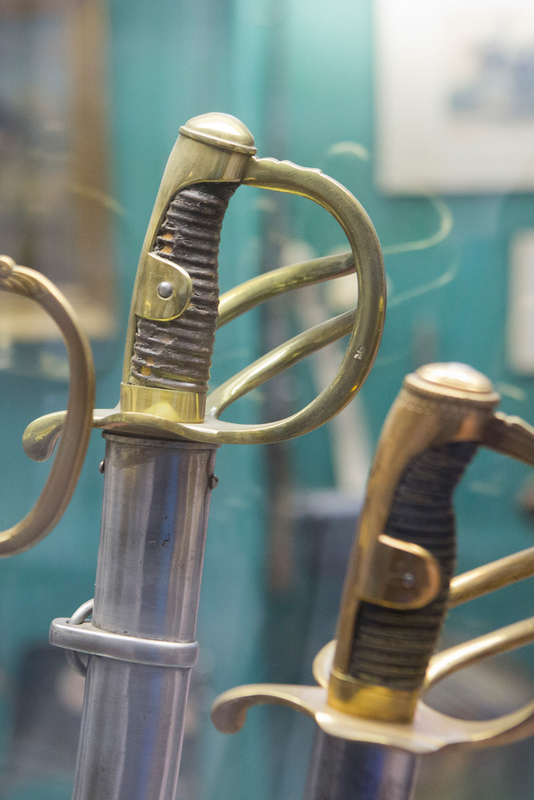 This saber was used by both the light cavalry and the artillery even after they were given the French 1822 pattern light cavalry saber in 1834. Blade with ricasso, two hollow sides, but no fullers. It is 89 cm long and has a curvature of 3.6 cm. Brass hilt, with three bars. The main bar is prolongated into a quillon and supports a small counterguard. Beaded pommel which extends along the back of the grip and sports two ears, which are connected, through the grip, by a rivet. Wooden grip with thin spirals, bound in twine and covered in leather. Steel scabbard, with wooden inserts and two bands with loose ring. Asymmetrical shoe. 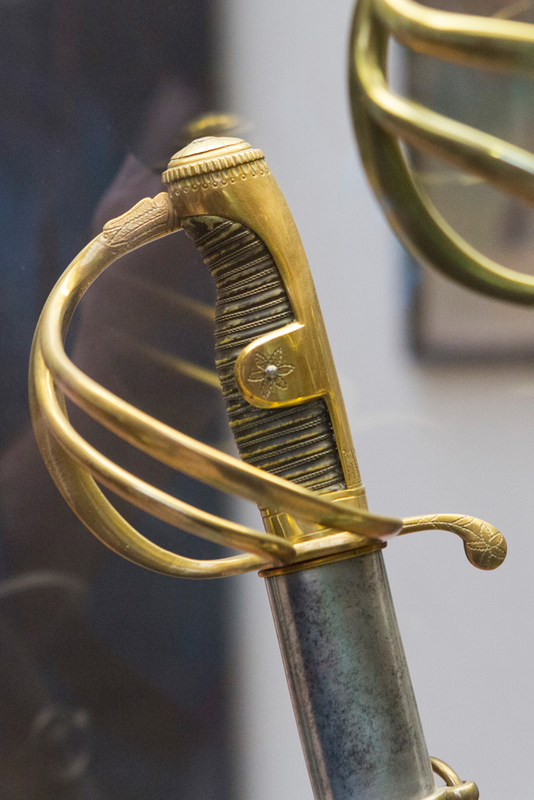 The royal decree of July 4th 1835 attributed this saber, with a gilt hilt, to the officers attached to the superior staff of the Civic Guard. This is the French model, without any modifications. Straight double fullered blade, 97.45 cm long and 3.6 cm wide, point in line. Brass hilt with four bars. The main bar is attached to the pommel via a hooked pin and prolongated, on the opposite side into an edged counterguard. The other three bars are thicker where they are attached to this counterguard. Beaded pommel in the form of half an olive. Wooden grip bound in twine and covered in leather, then bound with twisted brass wires. Brass ferrule at the base of the grip. 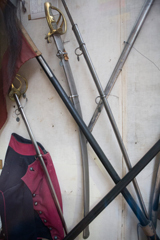 Steel scabbard, with wooden inserts and two bands with loose ring. Symmetrical shoe. 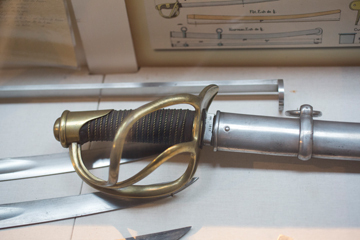 This saber was used by the Cuirassier as of November 20th 1830, and by the mounted Gendarmerie as of April 15th 1832. Curved blade, 92.3 cm long with a wide fuller on each side and a thin fuller on each side near the back edge. Curvature of 3.6 cm. Point in line with the back edge. 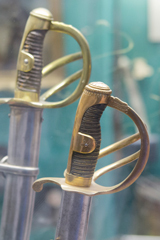 Brass hilt, with three bars. The main bar is attached to the pommel via a hooked pin and prolongated, on the opposite side into an edged counterguard. Wooden grip bound in twine and covered in veal leather, then bound with twisted brass wires. Steel scabbard, with wooden insert and two bands with loose ring. Asymmetrical shoe. This saber was used by the artillery, light cavalry and Guides as of 1834. Curved blade, 97.45 cm long with a two fullers. 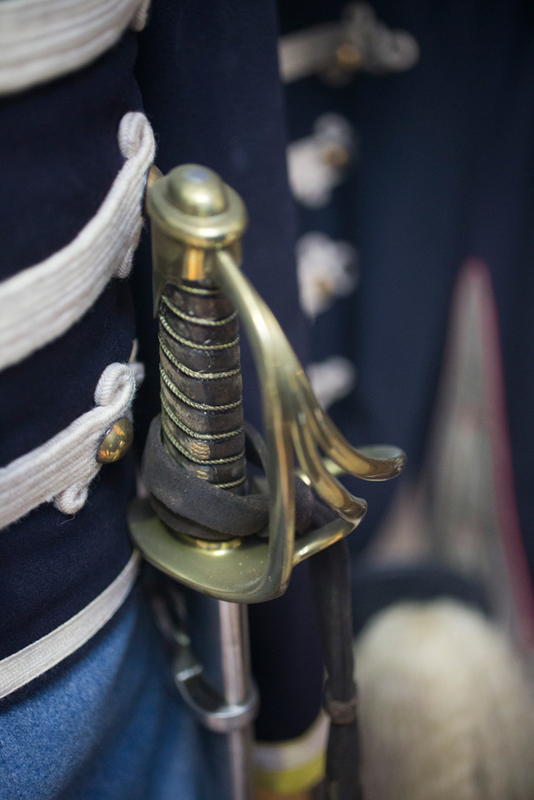 The curvature of is a little inferior to that of the 1822 pattern light cavalry saber. 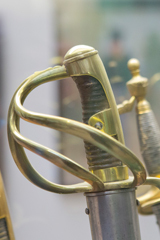 Brass hilt, with four bars. Pommel in half olive. Wooden grip bound in twine with big spaces between the turns, covered in veal leather, then bound with twisted copper wires. Steel scabbard, without wooden insert. Mouthpiece with spring mechanism and two bands with loose ring. Asymmetrical shoe. 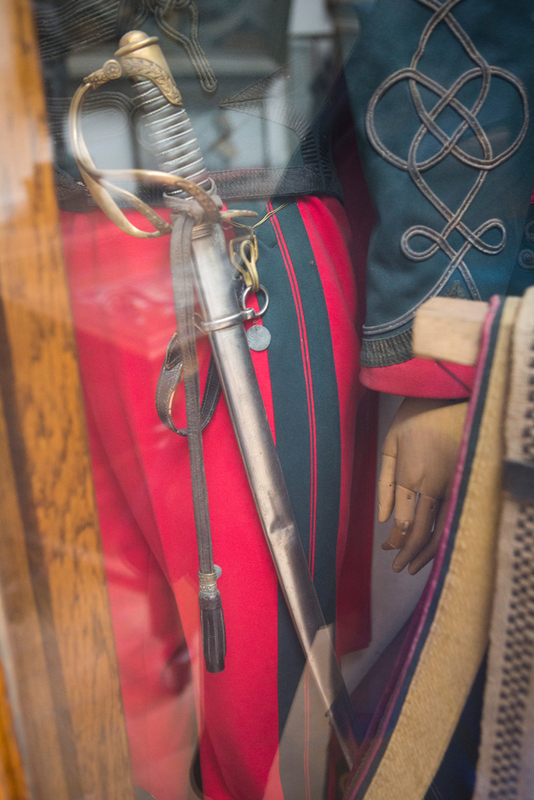 This saber was attributed to the guides as of 1841 because it was more appropriate than the 1822 pattern Light Cavalry Saber , taking into account that the guide's horses were bigger than that of other outfits. a much lighter blade, 3 cm wide and with a carp's tongue tip. a grip with a round section with thinly spaced wire loops. a longer and thinner scabbard shoe. a blade tip in the form of a carp's tongue. a grip with a square section with largely spaced wire loops. the lower scabbard band is absent and the upper one now has both loose ring and mortise. the scabbard shoe is smaller. the scabbard mouth is larger. its grip has a square section. 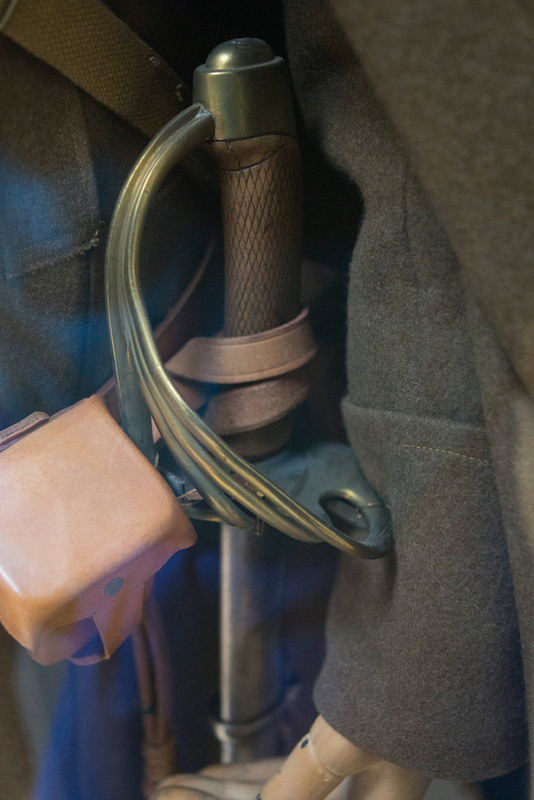 extra lead has been added to the pommel. the scabbard locket is larger. 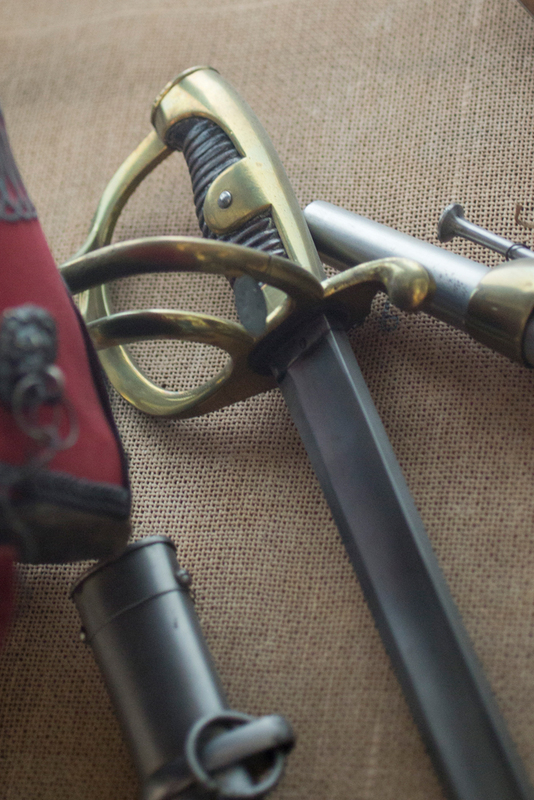 Is a 1822 pattern Light Cavalry Saber with a square grip. The lower scabbard band is absent and the upper one now has both loose ring and mortise. This is a modification of the Montmorency Saber. The lower scabbard band is absent and the upper one now has both loose ring and mortise. 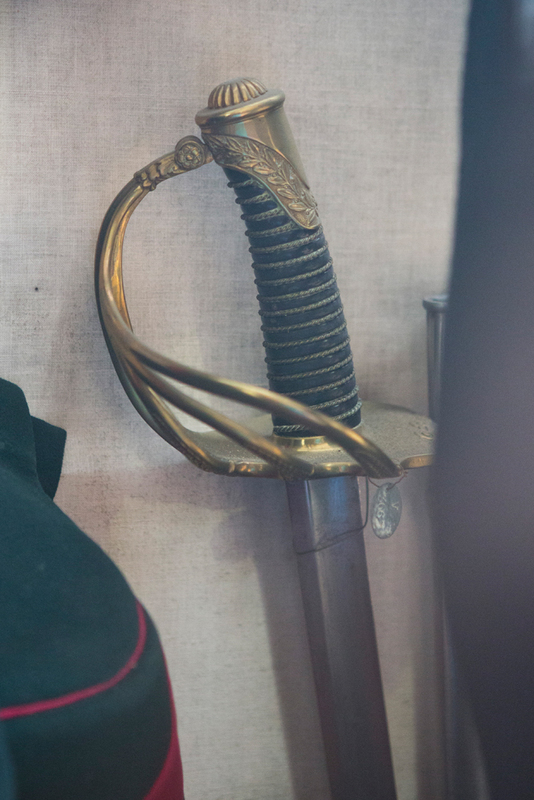 This saber was no longer in use as of 1910. This is a modification of the An XI pattern Heavy Cavalry Saber. The hilt has three bars, the fourth having been cut off. 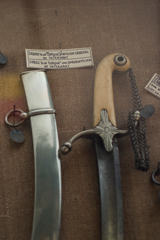 The scabbard has but one band, with both loose ring and mortise. This model is identical to the pattern 1852-1888 Train Saber, but the hilt shows no hint of a fourth bar. the grip is made of a 12,5 cm piece of nut wood chiseled into a rectangular pattern. the filigree and leather cover are absent. a finger ring has been added close to the shell. rem : by 1910, the finger ring was abandoned. 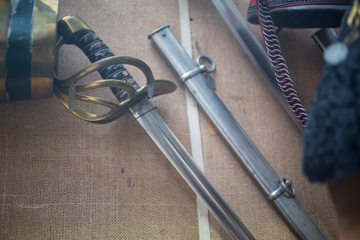 This is the 1822-1873 pattern Guide Saber, modified in the same way as the 1822-1883 pattern Light Cavalry Saber modified 1894, but the grip is 13 cm long. rem : by 1910, the mortise was no longer found on the scabbard band. The regent's decree of July 14th 1832 attributed a hussar's saber with iron guard to the Civic Guard's cavalry. 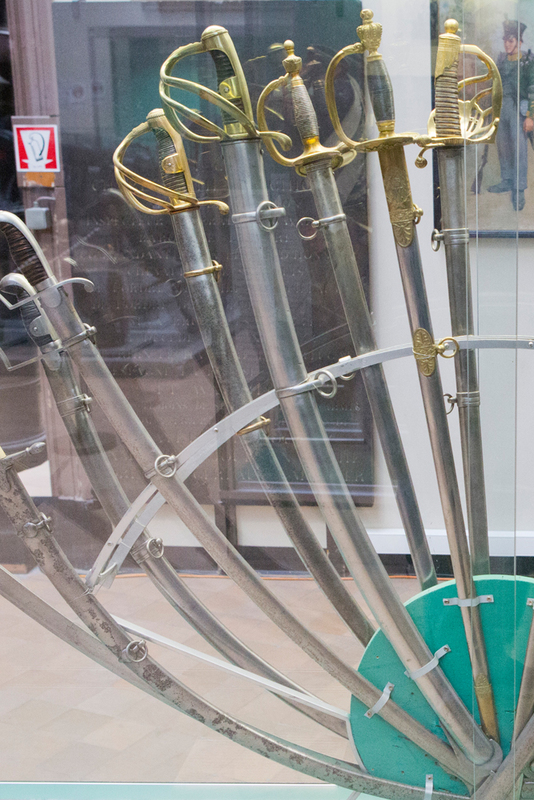 This was later replaced by the army's cavalry saber. 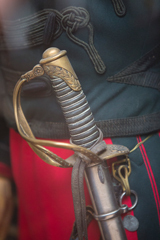 As of around 1905, the Civil Guard's chasseurs à cheval received a Rapier Saber. Straight blade, 90cm in length and of diamond section. Steel bowl guard, chiseled and pierced for decoration and for a mortise, next to the pommel. Reinforced pommel. Wooden, leather covered, grip bound with twisted steel wire. Steel scabbard, with a single band sporting both ring and mortise. 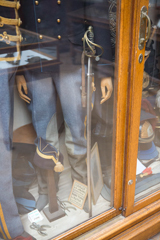 This sword was in use by the Civil Guard's chasseurs à cheval as of around 1905. 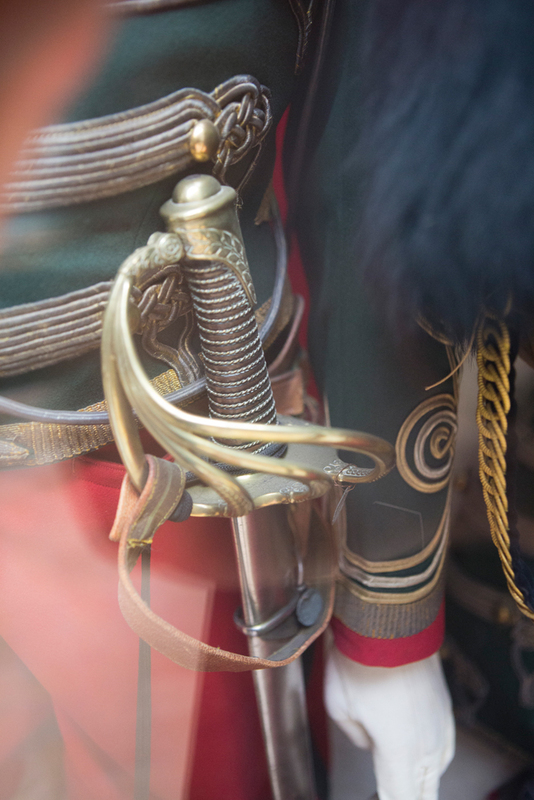 This saber is a further modification of the 1852 pattern Cuirassier saber. Straight, double-edged, double fullered blade, 88 cm long. a steel scabbard with a single band and loose ring. Mortise ?. 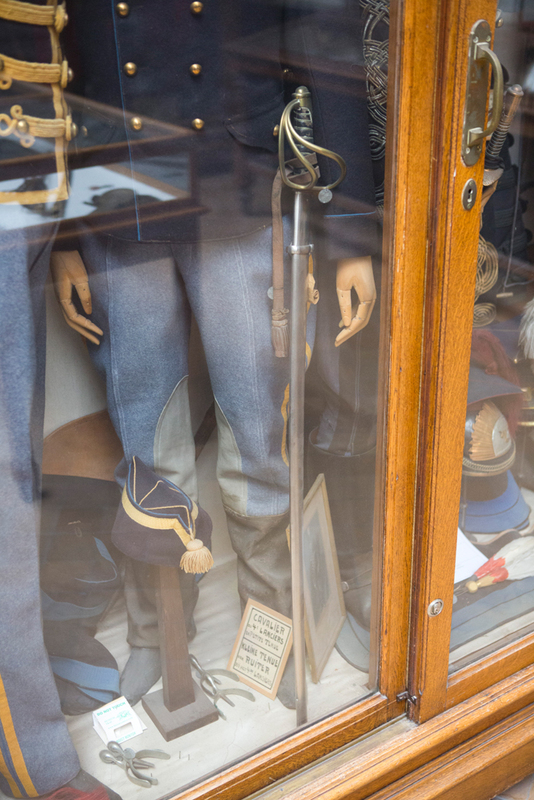 Officers were attributed the same models as troopers, though officer's sabers were often lighter and better finished. Hilts showed some decorations and were in gilt copper or browned and chiseled chrysocale. 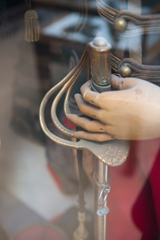 The grip is in horn or wrapped in fine veal leather, bound with gilt silver wire. 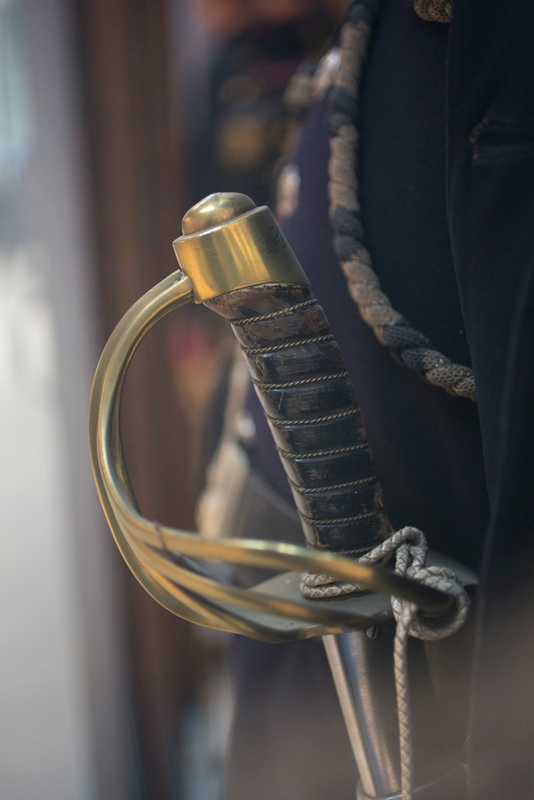 The scabbard is of polished steel, most often without wooden inserts. Officers from the chasseurs à cheval often had scabbards with gilt copper bands and rings while Guide officers used the Cuirassier's officer's sword until July 24th 1843, at which time they switched to the French 1822 pattern de ligne cavalry saber. 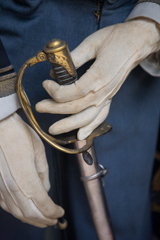 The directive of December 18th 1830 attributed a curved saber with ivory hilt to staff officers. 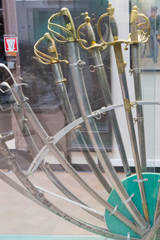 As of February 19th 1832, this was replaced by the Montmorency saber. Generals and colonels in charge of provinces carried the same sword as of October 18th 1832. This saber was later replaced by the light cavalry saber. 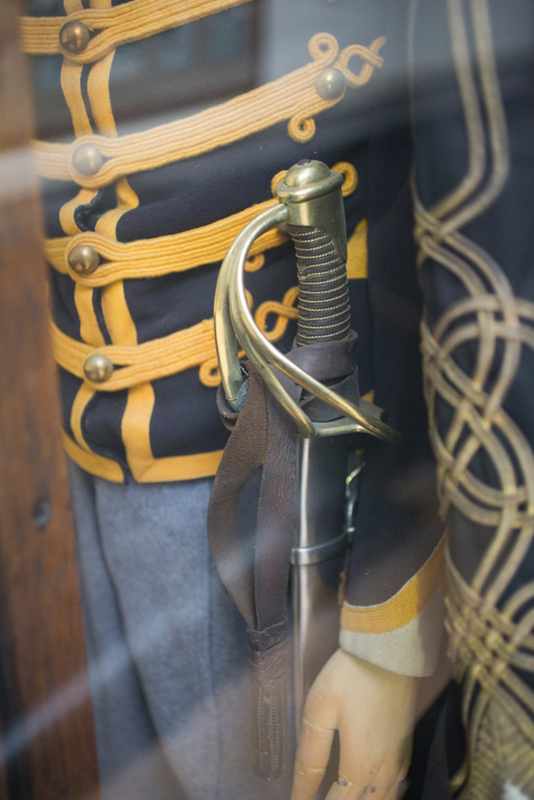 As an illustration, here is a Dutch Light Cavalry model nb 3 and a Montmorency 1802 pattern Officer's Sword. The royal decree of June 18th 1836 describes a Turkish-style saber for intendants, but gives precious little information about it. 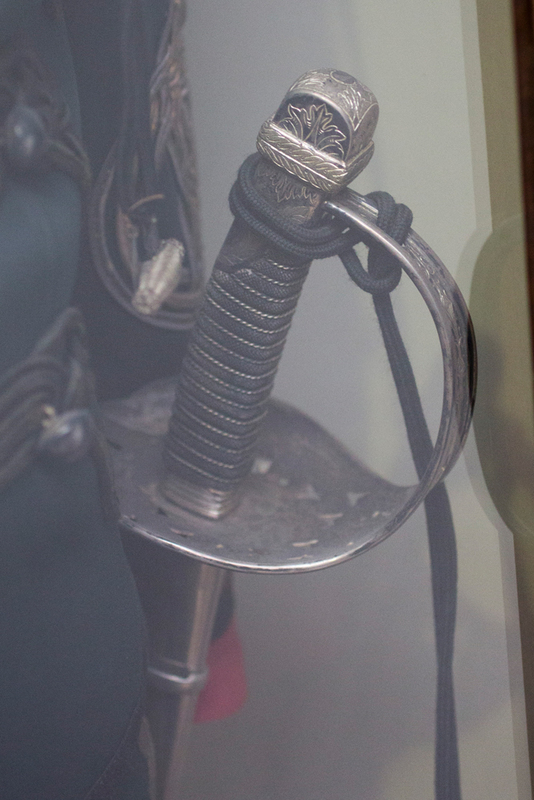 The blade is curved, the grip in ivory, with a Turkish-style guard and a steel chain going from hilt to pommel. The grip is pierced to allow for the sword knot to be attached. 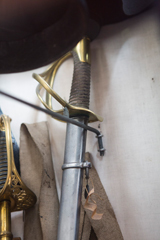 Steel scabbard with two bands and steel shoe. Period documents show that such swords were also worn by generals and Light Cavalry officers. This saber was replaced on June 6th 1847 by the 1st general model smallsword. 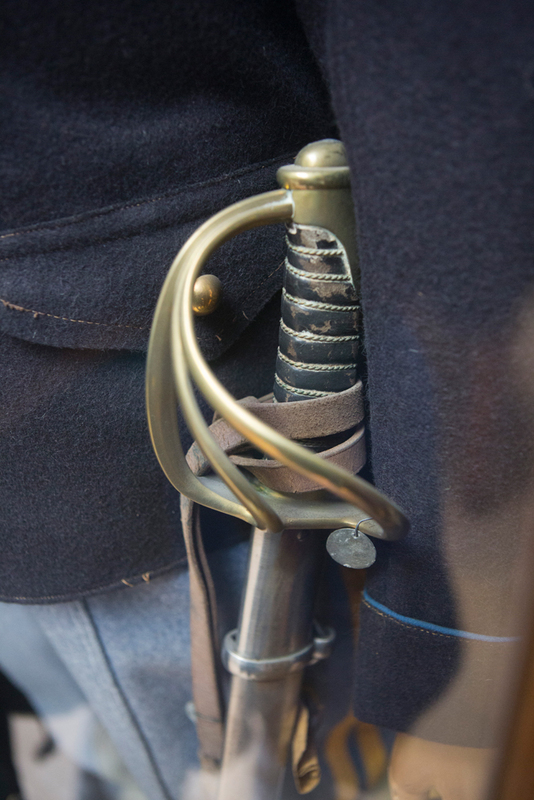 Some officer's swords are barely documented. Among them a hussar sword with ivory grip attributed to the general inspector of the customs services and several other customs officers by the royal decree of June 14th 1832. This saber had a single bar guard 'of the German type'.